Garfield fancies himself as the most important cat in the world. 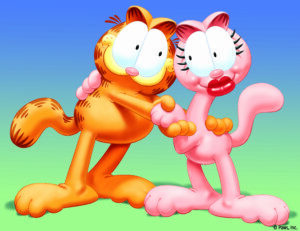 But who’s the second finest cat in Garfield’s opinion? It’s the alluring Arlene, of course! Slender, sleek, long-tailed, pink-furred, with plush red lips, Arlene has managed to capture Garfield’s heart. 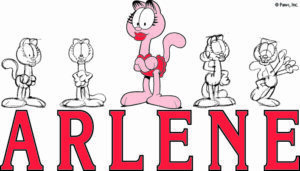 Arlene first appeared in the comic strip on December 17, 1980. Earlier in the strip run, she also had a big gap between her front teeth. Arlene is known to be sweet, charming, and caring, but does not shy away from matching wits with Garfield when she feels like it, often cracking jokes at his expense. Though Garfield will always be in love with himself first, Arlene has managed to become his girlfriend. Of course, however alluring Arlene might be, though, if Garfield were to choose between her and a dish of lasagna, there would be no contest.